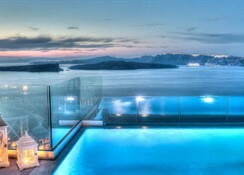 Boasting a stunning setting on the island of Santorini- this mesmerising hotel commands magnificent views over the Caldera and the Aegean Sea. 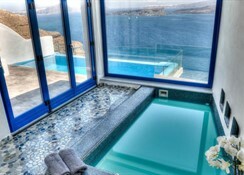 The hotel enjoys ease of access to the archaeological site of Akrotiri- which lies just 1.5 km away. Guests will find themselves just a short driving distance away from the stunning Red Beach. The hotel lies within easy access of a number of the area's most prominent attractions. 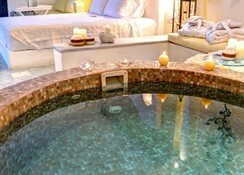 This delightful hotel tempts guests with the promise of unparalleled luxury and elegance. 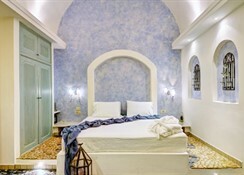 The hotel enjoys traditional Greek style and charm- featuring a pristine- white-washed exterior. The hotel oozes decadence and poise- comprising beautifully-appointed guest rooms. The rooms offer a peaceful oasis in which to completely unwind at the end of the day. This wonderful hotel is sure to impress even the most discerning traveller.